Absorb the calming coastal energy of Cornish living from Tanzarra, a welcome addition to the Cornish Cribs portfolio, this uber-smart holiday pad has been built with luxury in mind. This show-stopping timber framed new build showcases the A1 eco credentials, luxury finishes and oversized living. An unrivalled location in the heart of North Cornwall, Tanzarra sits atop the dramatic cliffs of beautiful Mawgan Porth with breathtaking ocean, beach and headland views. 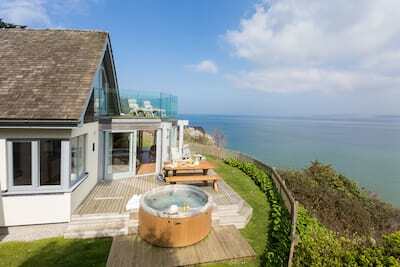 An exemplary house-by-the-sea where up to ten guests can stay, play and re-energise. Up to 2 well behaved dogs welcomed. Space, light and warmth flow throughout the open plan living areas of the ground floor. From the chic black finish and clean lines of the stylish kitchen, the grey/blue slate flooring throughout to the home from home finishing touches this spacious holiday pad sets the scene for the ultimate in beach style living. Tanzarra comes from the heart of its Cornish creator with every bolt, banister and beam handcrafted to create a flawless finish. The first floor offers a serene sanctuary of bedrooms and bathrooms not least the indulgent master bedroom with contemporary ensuite bathroom and uninterrupted views. The quiet upstairs living space with generous balcony is beautifully serene and decked out in cool blues and linen whites. Gather together as the sun sets in the bay for the perfect end to a summers day. Bespoke artwork adorns the whitewashed walls with a surfing theme which evokes the Cornish adventures you can reach from your holiday door, whilst handpicked modern retro furniture compliments the clean spaces. Worthy of Grand Design status, the imposing clean lines and glass box-like appearance are truly striking. 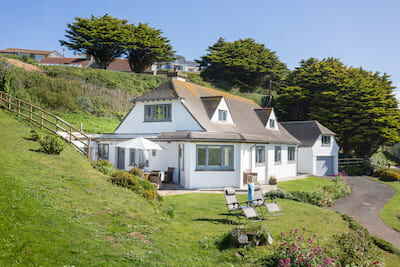 Tanzarra sits proudly overlooking the sea, cliff, beach and headlands of Mawgan Porth. Family days are spent on the generous decking area and grassed lawn leading down to the coastal path and steps to the beach. Check the morning surf from your bed and hit the waves before breakfast. Children will love the sense of freedom and open space as they flit from sandcastles to kite flying to rock pooling. 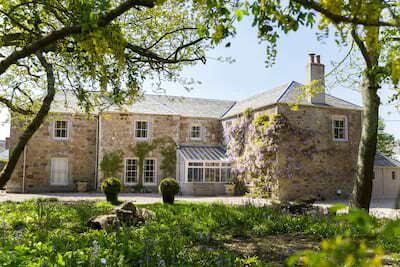 If it's a long overdue friends catch up then choose to follow the coast path to the much acclaimed Jamie Oliver's Fifteen for a lazy lunch or enjoy the talents of a private chef in-house. Map your days out from North coast to South, dining and shopping in nearby Padstow, Sailing days from maritime Falmouth, garden explorations with The National Trust or for the thrill seekers in the group try your hand at kitesurfing or even kitebuggying at The Extreme Academy. Whether for a beach style family holiday, the ultimate friends hideaway or luxury break made for two, Tanzarra offers a unique coastal experience in all seasons. Tanzarra permits 2 dogs to stay, a pet supplement of £69 is applicable and a £20 supplement for a second dog, house rules apply. There is a large boot room/utility area where dogs can be left to dry off after the beach etc! Highly efficient home with many eco credentials: timber frame, triple glazed windows, underfloor heating and a unique air filtration system creates a high level of comfort for guests. Bright children’s room complete with a variety of toys, puzzles, sit ons, soft flooring, play tents. Also with additional Sky TV/DVD player and beanbags, perfect for older children. Laundry room with two machines, iron ironing board, drying racks, heated towel rail plus an additional oversized tumble dryer perfect for larger parties. Please note and as detailed in the gallery of images, Tanzarra has access to the cliff edge and children should be supervised at all times. Taking advantage of it's location, the garden isn't completely enclosed, enabling access to the footpath closeby. We had another spectacular stay at Tanzarra. Everything was wonderful, we have already booked for next summer. Features on the front cover of May issue of Coast Magazine. Pages 26-35 inside feature an article on the owners' journey building the house and their coastal lifestyle. 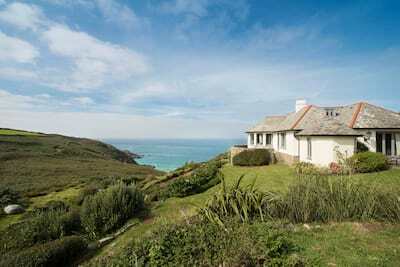 Fantastic property in a great location. Owner very friendly and helpful. Would definitely return.